One of the larger Guad's I've caught. 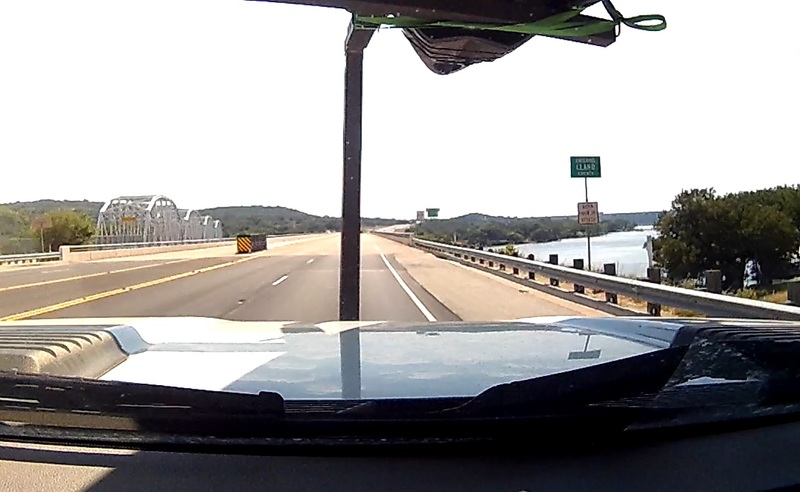 This is on the Llano River. 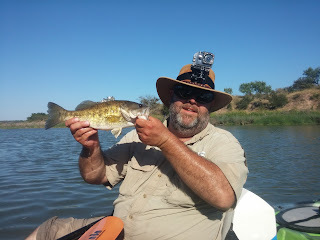 You see, several Central Texas rivers are unusual because they contain a native smallmouth call Guadeloupe Bass as well as some of the planted varieties. The Guadeloupe Bass is a wonderful little smallmouth bass that rarely grows to a large size. A 12in Guad is a pretty good size for a normal adult and a 17in Guad is a real treat - and a real good fight mind you! Guadeloupe bass are some of the fiercest bass I've ever caught. 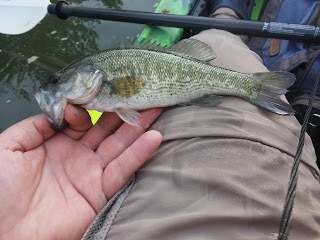 After having caught several dozen of them, I am just now getting used to how hard they hit. If you manage to latch on to a Guadeloupe bass of 14 inches or more the scenario usually plays out like this: "Fish on! Whoah! This is a huge bass! He's stripping line off my reel! Must be a huge large mouth! ... ... ... Oh look! It's a Guadeloupe!" I've had this experience only a handful of times since 14in Guadeloupe bass tend to be a bit rare. They are most certainly there and I've caught some in the 16in range that fought like a 5lb spring largemouth. Someday I'm going to catch a 3 pound Guad and when I do, it's going to be an epic battle. Beautiful little guad who was extremely photogenic. You see, the natural environment for native Guadeloupe is the quick flowing streams and rivers of central Texas. There are Guadeloupe bass in many of the rivers but the ones known for "perfect Guads" are the Llano River, San Gabriel River, San Saba River, and of course the Guadeloupe River. 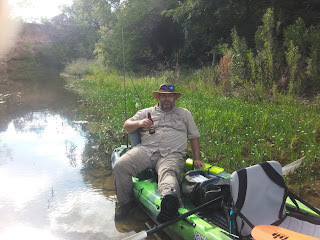 There are other rivers and lakes that contain them, but the Llano, The San Saba River, and the Guadeloupe River seem to have the purest strain. These rivers emanate from the deepest parts of the hill country which I think is where their origin is. I've caught some that were beautiful fish that looked like they belonged in an aquarium with other exotic fish. Yes, I feel privileged to live in an area that has such a beautiful fish that I can enjoy catching. Here's and album from the TPWD of the largest Guadeloupe bass ever caught. Now, I can hear some of you who are saying right now that they couldn't possibly fight harder than a northern smallmouth. Well, think of a Guadeloupe like a really tough version of the smallmouth bass... because they ARE smallmouth bass. They are simply built to handle the strains of central Texas. The cold water of winter and the scorching hot summers with warm water temperatures. I've caught them all year long at *ANY* time of the day. Try that with your northern smallmouth when the water temperature is 90 degrees or your southern trout when the temperature rises. No, the Guadeloupe knocks 'em dead every time in the summer heat. They will fight all the way to the boat and after a good picture session in 105 degree heat, splash you soaked as they head back into their watery habitat. It's those little moments when I get splashed from head to toe as a Guad puts a footnote on the experience I gave him that I realize this is why I fish. I come out here to see these beautiful fish that God made in their natural habitat - far away from the hustle and bustle of the "city life". This is why I get up at o'dark thirty and head far away into the country side. Yes, this is why I fish.